Satisfy your inner culture vulture at National Air and Space Museum and National Gallery of Art. There's still lots to do: take an in-depth tour of United States Holocaust Memorial Museum, pause for some serene contemplation at Washington National Cathedral, pause for some photo ops at Vietnam Veterans Memorial, and get a sense of history and politics at White House. To see ratings, maps, photos, and more tourist information, read our Washington DC road trip planning website . Rome, Italy to Washington DC is an approximately 13-hour combination of flight, bus, and subway. You can also fly; or do a combination of flight and train. The time zone changes from Central European Time to Eastern Standard Time, which is usually a -6 hour difference. In August, daytime highs in Washington DC are 36°C, while nighttime lows are 25°C. Wrap up your sightseeing on the 8th (Thu) to allow time to take a train to Philadelphia. Kick off your visit on the 9th (Fri): explore the world behind art at Rodin Museum, admire the masterpieces at Barnes Foundation, then get engrossed in the history at Eastern State Penitentiary, and finally get engrossed in the history at Independence Hall. Here are some ideas for day two: ponder the design of Longwood Gardens, explore the world behind art at Philadelphia Museum of Art, and then steep yourself in history at Liberty Bell Center. For where to stay, more things to do, photos, and other tourist information, read our Philadelphia trip planner. Traveling by train from Washington DC to Philadelphia takes 2 hours. Alternatively, you can drive; or take a bus. In August, daily temperatures in Philadelphia can reach 34°C, while at night they dip to 24°C. Wrap up your sightseeing on the 10th (Sat) to allow time to take a train to New York City. Your cultural itinerary includes sights like The Metropolitan Museum of Art and 9/11 Memorial. There's much more to do: take in the pleasant sights at Central Park, steep yourself in history at Ellis Island, get a new perspective on nature at American Museum of Natural History, and contemplate in the serene atmosphere at St. Paul's Chapel. To see maps, reviews, ratings, and other tourist information, read our New York City road trip planning tool . Getting from Philadelphia to New York City by train takes about 2 hours. Other options: drive; or take a bus. In August, daily temperatures in New York City can reach 34°C, while at night they dip to 25°C. Finish your sightseeing early on the 14th (Wed) so you can travel to Boston. Satisfy your inner culture vulture at Museum of Fine Arts and Peabody Essex Museum. When in Boston, make a side trip to see Orchard House in Concord, approximately 40 minutes away. There's much more to do: get engrossed in the history at John F. Kennedy Presidential Museum & Library, appreciate the extensive heritage of Freedom Trail, pause for some photo ops at New England Holocaust Memorial, and admire all the interesting features of Fenway Park. For other places to visit, traveler tips, where to stay, and more tourist information, use the Boston road trip app . You can do a combination of bus and flight from New York City to Boston in 3 hours. Other options are to fly; or drive. Traveling from New York City in August, you can expect nighttime temperatures to be little chillier in Boston, with lows of 21°C. Finish your sightseeing early on the 17th (Sat) to allow enough time to take a train to New Haven. New Haven, in the U.S. On the 18th (Sun), steep yourself in history at The Mark Twain House & Museum and then examine the collection at Mystic Seaport Museum. On your second day here, see the interesting displays at The Submarine Force Museum, then steep yourself in history at Olde Mistick Village, and then steep yourself in history at Gillette Castle State Park. To see more things to do, traveler tips, ratings, and other tourist information, go to the New Haven online journey planner . You can take a train from Boston to New Haven in 2.5 hours. Alternatively, you can take a bus; or drive. In August, plan for daily highs up to 32°C, and evening lows to 21°C. On the 20th (Tue), wrap the sightseeing up by early afternoon so you can travel to Chicago. Start off your visit on the 21st (Wed): appreciate the extensive heritage of Millennium Park, appreciate the history behind Cloud Gate, admire the masterpieces at The Art Institute of Chicago, then admire all the interesting features of Wrigley Field, and finally take in the spiritual surroundings of Fourth Presbyterian Church. Keep things going the next day: get curious at Museum of Science and Industry, examine the collection at The Field Museum, and then admire the local landmark of Buckingham Fountain. To see photos, other places to visit, where to stay, and tourist information, refer to the Chicago tour itinerary maker site . Traveling by flight from New Haven to Chicago takes 6.5 hours. Alternatively, you can do a combination of train and flight; or drive. Traveling from New Haven to Chicago, you'll gain 1 hour due to the time zone difference. In August, plan for daily highs up to 33°C, and evening lows to 22°C. On the 23rd (Fri), wrap the sightseeing up by early afternoon so you can travel to Miami. 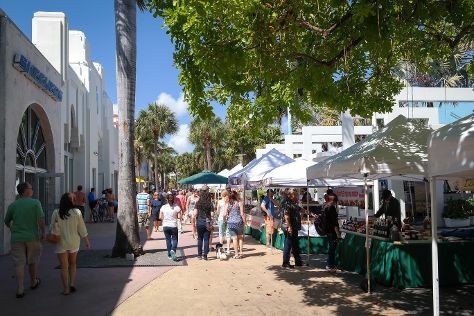 Start off your visit on the 24th (Sat): examine the collection at Vizcaya Museum and Gardens, then enjoy some diversion at Lock & Load Miami, then take a stroll through Lincoln Road, and finally take in the exciting artwork at Britto Central. On your second day here, wander the streets of Ocean Drive, appreciate the extensive heritage of Art Deco Historic District, and then kick back and relax at South Beach. To find ratings, maps, and tourist information, read Miami trip itinerary builder site . Traveling by flight from Chicago to Miami takes 5.5 hours. Alternatively, you can do a combination of flight and bus; or drive. The time zone difference moving from Central Standard Time (CST) to Eastern Standard Time (EST) is 1 hour. In August, Miami is a bit warmer than Chicago - with highs of 38°C and lows of 30°C. Wrap up your sightseeing by early afternoon on the 26th (Mon) to allow time for travel back home.